Top: "The Press Room of the New York Tribune". Frank Leslie's Illustrated Newspaper, July 20, 1861, p.156. Bottom: "Printing Room of the 'New York World' Newspaper-The Great Perfecting Press". Scientific American, March 4, 1882, cover. Inventions in the early 19th century revolutionized newspaper printing in speed and page capacity. Introduced in 1832 by the New York inventor and manufacturer Robert Hoe, the steam-powered cylinder press mechanized the printing process, moving it, finally, away from the flat bed of type and hand-pulled levers of the Renaissance. In 1846, rotary presses began placing the metal type directly on the cylinder, leading a decade later to the Hoe "Lightning Press" which combined ten cylinders in one machine. This method was labor-intensive: workers had to feed individual sheets of paper by hand to each of the ten impression cylinders, which printed one side at a time. Maximum capacity was 20,000 sheets an hour. The next advance was the Hoe Web Perfecting Press, first constructed in the old Tribune Building in 1873. The web press printed on a roll or "web" of paper and cut the printed sheets into pages. The term "Perfecting Press"referred to printing on both sides of the roll. Automatic folders were added in 1876, removing the need for a team of boys to fold papers manually. 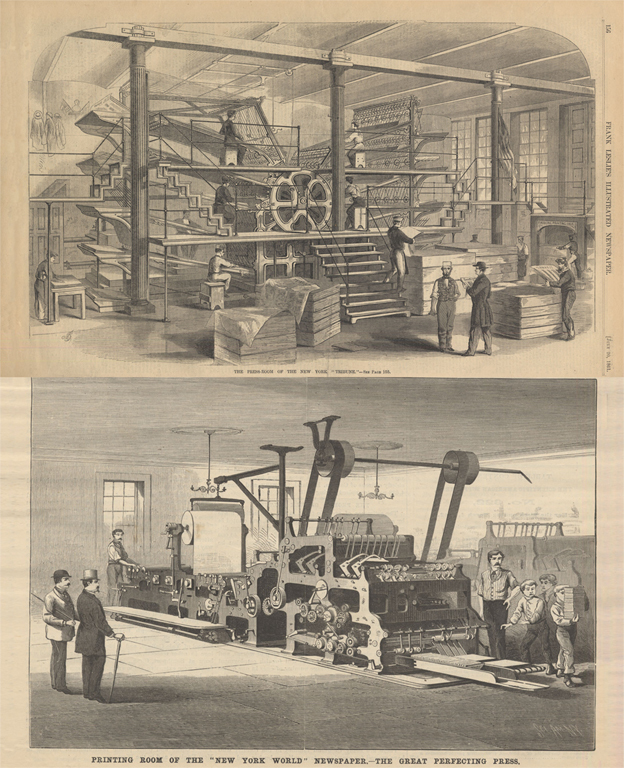 These advances resulted in an automatic press with a capacity of 12,000-14,000 multi-page newspapers an hour that could be operated by only two men and that took up far less space than the ten-cylinder "Lightning Press."